If anyone knows about digital consoles, it’s Yamaha — and their latest range of mixers doesn’t disappoint. Yamaha have, for many years, been one of the major names in the world of digital mixing, and their recently introduced TF series appears to have placed a huge emphasis on making their established excellent audio performance available in an easy–to–use package. This will find favour with those users wishing to get great results without necessarily diving under the hood with a reference manual or needing to ‘do the course’. The present line–up consists of three models, the basic difference being the number of physical faders and inputs on the three sizes of surface. 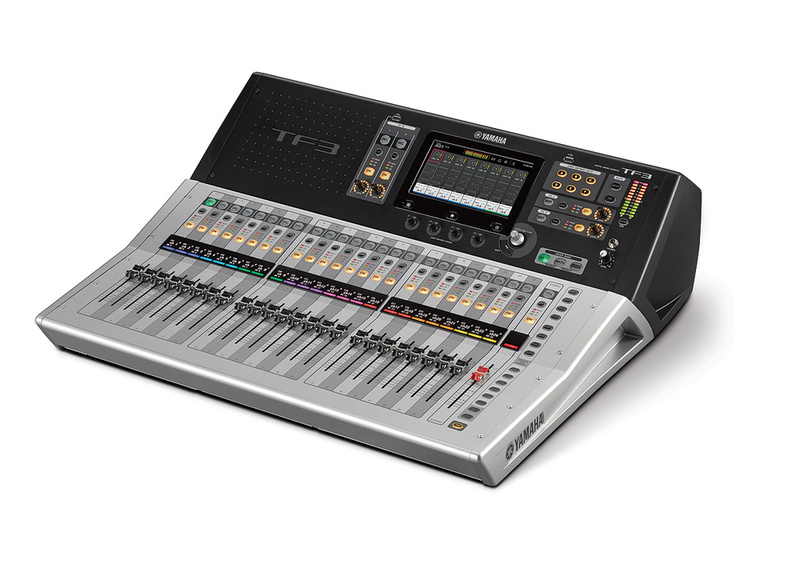 The smallest model, the TF1, has 16 channel faders plus a master fader, and is designed to be used as a tabletop console or installed in a standard 19–inch rack (with its side handles removed). The TF3 and TF5 versions have 24 and 32 channel faders respectively, and the number of physical inputs on the rear panel of each model corresponds to the fader count. 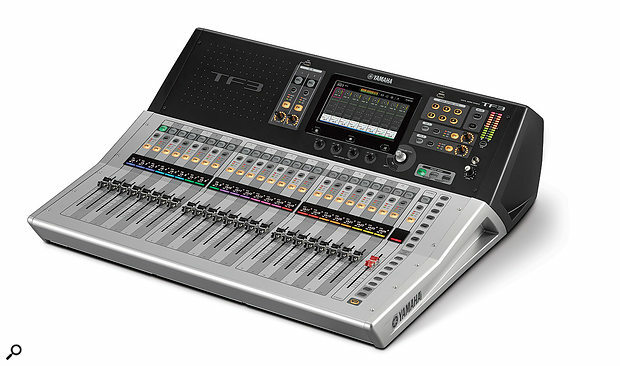 The output bus count, effects processing and so on is the same on all three variants, but it’s worth pointing out that, despite the physical input/fader count, the TF3 and TF5 actually have 48 mix channels and the TF1 has a total of 40. I spent some hands–on time with both the TF1 and the TF3, and although I didn’t get to use them on any large–scale events (mainly because the digital stagebox option isn’t yet available; it will start shipping in the first half of 2016) I did have a good play about in the studio, and managed to get the TF1 out to a live function where I could use the local inputs and outputs connected directly from/to the stage. Yamaha’s pro audio boxes have always tended to have a ‘pro’ look about them, and happily the TF series carries on with that tradition. The profile of these mixers is quite bold, and they have a distinctly angled–up display and control panel, which not only looks the business but makes the touchscreen and other controls easy to see and operate from a sitting position behind the faders — which is where your average sound engineer tends to be. The TF mixers are finished in a mix of silver and black on the main surface; black at the top around the screen, and a silver lower background around the faders and dedicated channel buttons. There is also a very effective stripey effect which holds your eye within the channel you’re looking at and removes the need to run your finger up and down the channel strip to make sure you’re adjusting or pressing the correct thing... If you’ve used a mixer, ever, you know what I mean! The basic mixing functions are straightforward and easy to understand, mainly because — for the unfamiliar or occasional user — there is no input-patching to worry about. The physical inputs on the back panel are hard-wired to the channels on the top surface, so if you plug a mic into input 1 it’s always controlled on channel 1 by fader 1, and so on. This is something which more experienced users may find limiting, but it really isn’t a big deal and it will be interesting to see if further patch options are made available at some stage after the digital stagebox becomes available. I won’t try and cover anything like the full feature set here, as the information is all available online, but in my brief spell with the TF mixers I did find certain features very appealing. All the input connectors are ‘combi’ types and will accept XLR or balanced/unbalanced standard jack plugs, which feed into Yamaha’s ‘D–Pre’ preamps. Nominal input signals from –62 to +10 dBu are accommodated, which should be enough of a range to cope with almost anything the guys on stage throw at you. The 16 output connections are called ‘Omni Outs’ and carry the analogue output signals from the mix buses; these can be freely patched however you like, although numbers 15 and 16 are labelled L and R and carry the main mix out by default. There are also two sets of unbalanced stereo input jacks (RCA type) for connecting consumer playback devices and the like. A single RJ45 connector is used to plug in an Ethernet cable, which allows external control and programming using a software editing application on a PC or Mac. The USB port on the back connects to a computer running a suitable DAW for playback and recording; 34 channels are streamed at 24–bit/48kHz, and there’s a free 16–track version of Cubase AI available for download by following the instructions on the bundled leaflet. Something you don’t always see on the back of a digital mixer is a footswitch jack — a facility the TF mixers do have — which can be used to bypass effects, mute inputs or apply tap–tempo to effects if your hands are otherwise engaged. The main user interface is very well laid out, and there’s a particularly interesting relationship between the ‘hard’ buttons, knobs and faders and the functions accessed through the large touchscreen. Yamaha have obviously put a lot of design effort into the workflow side of the TF series, and although it takes a bit of getting used to — depending on what you’ve used before — I have to say that it works very well, and most functions seem to fall naturally to hand. The TF-series consoles feature a generous complement of I/O: 16 assignable outputs are present on all versions, with the TF1, TF3 and TF5 having 16, 24 and 32 local inputs, respectively. The touchscreen itself seems to respond easily, the screen layouts are just the right size for easy visibility of information and status, and the touch control areas are well–spaced. Various forms of finger–swiping control are supported, and the EQ section is a particularly good example of this; curves can be dragged up, down and sideways, and the sharpness of the curves easily and intuitively widened or narrowed by using a two–finger technique that will be second nature to all tablet users. I very much like the way Yamaha have doubled up the on–screen controls with a hardware option; in general, any parameter that can be swiped or dragged to change its value can be highlighted (if there’s a pink outline round it, it’s in focus) and adjusted with a ‘touch and turn’ rotary control just to the bottom right of the screen. The operation of the mix process is a simple one: in its default state the control surface shows a number of input channels assigned to the faders, with the stereo output bus level on the dedicated right–hand master fader. The inputs are arranged in two fader banks, brought into focus by pressing one of the fader–bank select switches, and if both are pressed together the eight DCA groups are controlled by the right–hand fader bank. This DCA mode has a very neat ‘roll–out’ feature that assigns the channels belonging to the currently selected DCA group to the remaining faders to the left — so, for example, in DCA mode, you get all the DCA groups on the current fader layer, and selecting, say, the drum kit DCA fader, brings up the individual channels (kick, snare, toms, etc) to the left, so precise individual control within all the groups is available without exiting DCA mode. How neat is that? This is the way I like to mix live shows anyway, with the desk showing a mix of DCA groups and inputs on the same layer, and the TF mixers also provide a fully flexible custom fader layer to which you can assign any input or bus on any fader. My first (non–Yamaha) fully digital console is still in regular use, and is an excellent and flexible workhorse, but one thing I miss compared to more up–to–date mixers is the digital scribble strip. The TF series has a particularly good, high–resolution ident strip which is very easy to see, even in full daylight. The text is a crisp white on black and shows various pieces of information about the channel, including whether gates or comps are in use, as well as input/bus info and, of course, channel name. The scribble strip is colour–coded by means of little windows below the main information bar, which are handy for quick identification of sources within groups. There is a little three–segment level meter on each channel, which serves to indicate the presence of a usable or too–hot incoming signal — at first I thought that these would be of little use but as ‘quick look’ indicators they worked well, and I like their position close to the channel select buttons rather than down near the faders. Selecting any input channel highlights it on the touchscreen, where a double–tap on any element within the on–screen channel strip brings up a detailed control screen for the compressor, gate, EQ or whatever you want to dive into. Adjustments can be made directly on the screen or by highlighting individual parameters and using the ‘real’ knobs on the panel. There are many, many neat tricks in the TF series’ repertoire, but what caught my eye were the effects mute button and the Gain Finder features. Near the main output meters are two hardware mute buttons, one of which kills all active effects sends and inserts. This is highly desirable for live shows where the musicians speak to the audience in between songs, and having a dedicated button means you don’t have to use up one of the user–defined keys. There is also an ‘all input’ mute switch, which is handy for silencing the system including aux sends without touching any output settings. Individual channels can, if desired, be excluded from this by making them ‘mute safe’ within the channel view screen. The Gain Finder feature is a simple means of adjusting the input levels to match the console’s head amps, and involves bringing up the channel input screen, which, in addition to the normal level meter, displays an optimising scale and a slider control. All you have to do is set the slider so that the large centre segment is illuminated and you’re good to go. There are also ‘one knob’ adjustments available on the channel parameters (gate, compressor, etc) which can be useful for inexperienced users. The TF has more configurable options than it first appears to. Some are found by using the touchscreen, for example the global metering view, which is very useful, especially when running a fairly complicated show — I love this feature when doing sound on a theatre production: I want to see all of my radio mics flickering happily just before the opening number. I’m running out of space here, so I must bring this brief look at the Yamaha TF series of digital mixers to some sort of conclusion. I’d have to sum up my experience as very positive, and something of a journey of discovery — the more I worked with the TF3 and TF1, the more I found they could do, and do very well. They are not expensive consoles, and neither do they claim to include everything any professional engineer might look for in a live–sound board, but I think it’s more a question of focusing on what they do rather than what they don’t. The sound of the D–Pre front-end amps is extremely clean and uncoloured, the effects are of the expected Yamaha quality, and all the basic operational functions are easy and intuitive. The integration of touchscreen and hardware controls has been carefully thought out and works very well, in my opinion, and the overall look and feel of the machine works well too — kind of traditional Yamaha in a modern, fresh–looking package. I would most definitely welcome a couple of these desks into my inventory — probably a TF3 and TF5, as my old 01V is still going strong at the moment! I’d venture to suggest that this would be an ideal console for those still looking to make the move from analogue to digital mixing, and it wouldn’t take anyone long to get comfortable with the workflow. When the Dante–based remote I/O stage box is available, the capabilities of these mixers will be fully accessible, and of course the Cat 5 snake option will be very attractive for mobile live–sound operators. Viable competition includes the Allen & Heath GLD series, the Behringer X32 series, Soundcraft’s Si consoles and the PreSonus StudioLive range. A well–equipped desk with a wealth of innovative features (eg. Gain Finder). Offline control and edit options. No input patching option (yet). Aux select buttons hard to read when not illuminated. A powerful digital console that is easy to use, sounds good, and has some thoughtful operational features. TF1 £1960, TF2 £2350, TF3 £2740. Prices include VAT. TF1 $2499.99, TF3 $2999.99, TF5 $3599.99.